We love a good movie. Don’t you? That’s why we went across the country with a video camera to capture recent installations and meet our delighted customers. So sit back, relax, pull up a pew and view a film for you! The Home Design Group work with hundreds of thousands of customers across Northern Ireland and our ethos came from a desire to offer a diverse range of quality products, professional craftsmanship and great value for money. To this day, we affirm that same promise. All featured products in the video are available for purchase now! Simply drop us a line on 028 9077 2077. Optionally, book an appointment and schedule a visit at the Duncure showroom. Look out for new videos on Facebook coming soon. We will show you how The Home Design Group replace your old roofline materials with new weather-resistant, maintenance free, PVCu roofline and cladding. 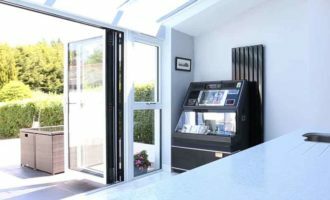 From windows to doors, rooflines conservatories, sunrooms and kitchens, bathrooms and bedrooms, we maintain an extensive variety of products defined by quality and style. From interior renovation to transformations, our professional designers will guide you though to make your exact specification come to life and we have such an experience of knowledge and products, we just had to make a film to show you! Finally, to see your exact specification come to life and this is why we are in business. Above all, We want to create a home for you. For your family and friends to use and enjoy. We want to create a space where you not only live, but a place where you make memories and experience all the tears, laughter and joys of living. A house where to can see your children grow up in and a house you can truly call your own.